Today's share is a masculine card that I made using the Acorny Thank You set. LOL, I just love the name of that set:) This is a great card that is straight to the point for that special guy in your life. 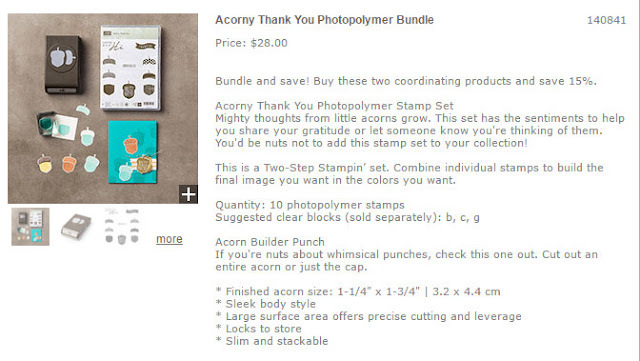 The set has a coordinating punch, the Acorn Punch that I used to punch all the acorns out with. You can purchase this stamp set and coordinating punch in a bundle and you would save 15%!! I chose a piece of DSP from the Going Places DSP stack and then chose to use a darker color (Soft Suede) for the base of my acorns. I was going to just leave them all Soft Suede, but decided not to and punched out a piece of Crumb Cake card stock after I did a tone on tone image to add the dots.